On Monday 20th July we had the pleasure of welcoming HRH The Duke and Duchess of Cornwall to Padstow as part of a three day trip to Cornwall. They began their tour on the quay where they met with Padstow Primary School before walking on to meet the RNLI crew, some local fishermen and the Shelter Box team as well as greeting those there to see them. The streets were bursting with people eager to greet the royal couple as they passed through the town, stopping at the Whistlefish Gallery which was started with a fund by the Princes Trust, before going on to listen to Cornwall Youth Band playing in the square. 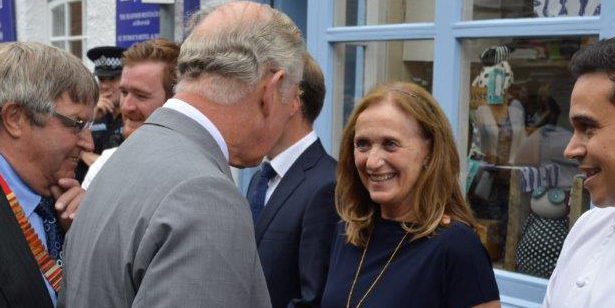 As the royals carried on their tour of the town, they met with Jill, Ed and Jack at Rick Stein’s Café along with Paul Ainsworth and his wife, Emma. The Duke and Duchess visited as part of their summer visit to Cornwall and joined the Stein family to recognise the 40th anniversary of the business. As well as the family, The Duke and Duchess wanted to meet with a number of those involved in the business from our apprentices and long-serving staff members to our suppliers, including Matthew Stevens and Ross Geach, and chefs. Stephane Delourme, head chef of The Seafood Restaurant, along with David Shrigley and Freddie Bevin-Nicholls, our apprentice commis chefs, talked of their time working in the kitchen and also David’s support from The Prince’s Trust. At the end of the visit, Jill presented HRH The Duke of Cornwall with a copy of our commemorative 40th anniversary book and a bottle of our 40th anniversary sparkling brut.